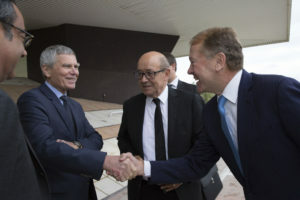 Robert Vassoyan (left), Jacques Biot shaking hands with John Chambers, with Jean-Yves Le Drian in the back. 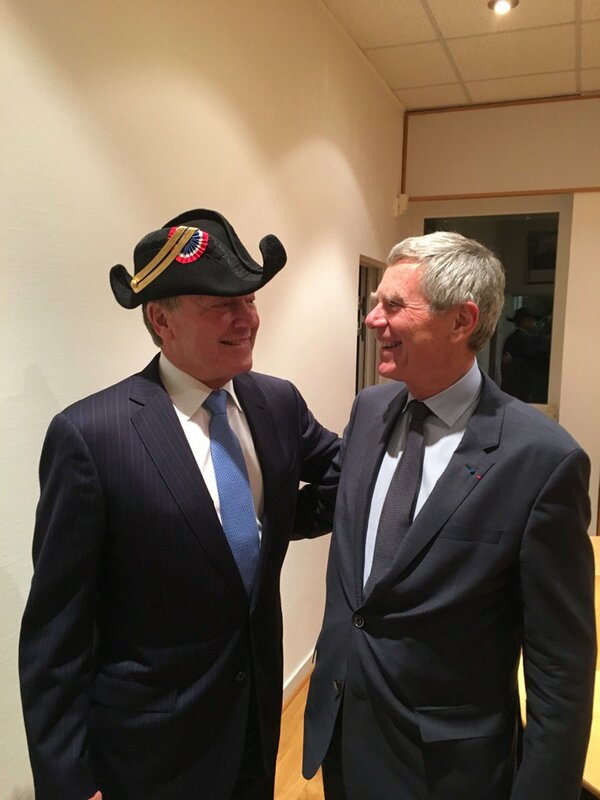 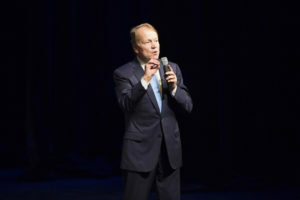 On October 18, 2016 the iconic former CEO, now executive president, of Cisco Systems, John Chambers, came to visit Ecole Polytechnique. 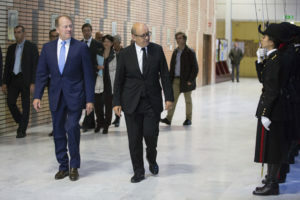 John came to Ecole Polytechnique late afternoon accompanied by Jean-Yves Le Drian, the French minister of defence, and Robert Vassoyan, director-general of Cisco France – and had a hectic agenda, of course. 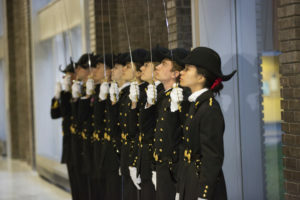 Our excellent photographer, Jeremy Barande, recorded key moments of John’s passing by Campus. 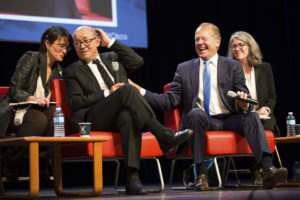 My colleague, Mark Townsley, took a few pictures as well (notably the “featured image”). 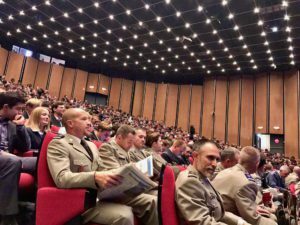 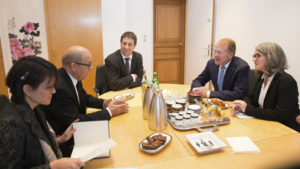 Despite the dense agenda, John and Jean-Yves Le Drian made a point of giving the bulk of their time on campus to a seminar with a “fireside talk” before our students at Polytechnique. 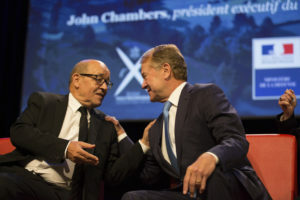 The talks by both Jean-Yves Le Drian and John Chambers were passionate, as were their responses to the questions from our students. 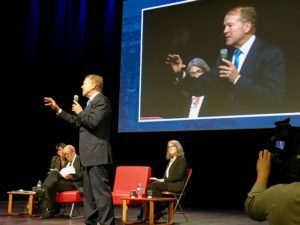 We live in a period of “disrupt or be disrupted” – where, according to John, 40% of all companies would disappear within a decade — and those remaining were those who would be able digitise and disrupt themselves (& their competition). 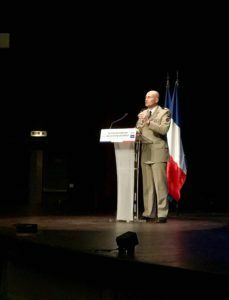 Thus, for a country such as France, the challenge is to create, train, engineers able to digitise and disrupt. 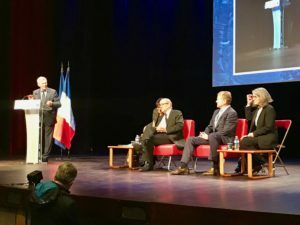 While we (Ecole Polytechnique) are incredibly good at training incredibly competent engineers and scientists, we need to emphasise also training incredibly courageous entrepreneurs: taking risks, failing fast, picking up the pieces, and trying again are traits that we’re need to cultivate, encourage.